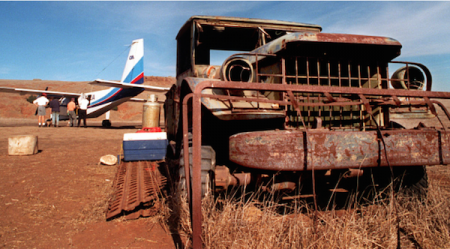 Channel Islands Aviation [CIA] was started in 1975 with pilot partners, Mark Oberman and Tom Driscoll. Initially operating out of Oxnard Airport, they took their first charter flight to Santa Cruz Island on January 1, 1975. The following year, on October 21, 1976, when the Camarillo Airport reopened from the Oxnard Air Force Base, the partners moved CIA to Camarillo. Initially, flights were operated to five airstrips on Santa Cruz Island (Campo Grande, above San Pedro Point, Main Ranch, Christy Ranch, the Point); Santa Rosa Island's main ranch strip east of Becher's Bay; and two airstrips on San Miguel Island (the relocated Hammond Field and Green Mountain). Private island owners, their guests, and hunting and recreational businesses operating on the islands relied heavily upon flights from CIA. After five years of operations, CIA became the official flight concessionaire to Channel Islands National Park when the park was created in 1980. Park personnel increased flight business as well. After more than two decades, Tom Driscoll left the partnership. 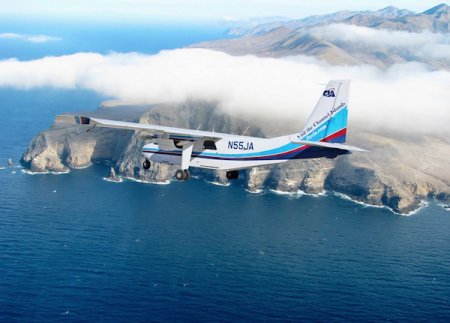 Today, after more than forty years in business, Channel Islands Aviation continues to fly to the islands as concessionaire to Channel Islands National Park. 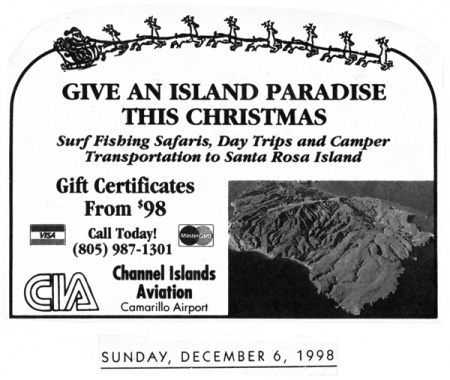 Only Santa Rosa Island is allowed to have commercially-available public flights under Park Service ownership. The business, now greatly expanded to include mainland charter and jet services, is currently operated by two generations of Oberman family. This page was last edited on 27 April 2017, at 20:27.